Are you getting ready to apply for your first home mortgage? Preparing to buy your first home is both exciting and nerve-wracking, and it pays to understand as much as possible about the process before you dive into it. What isn’t helpful is all of the misinformation out there about mortgage financing. 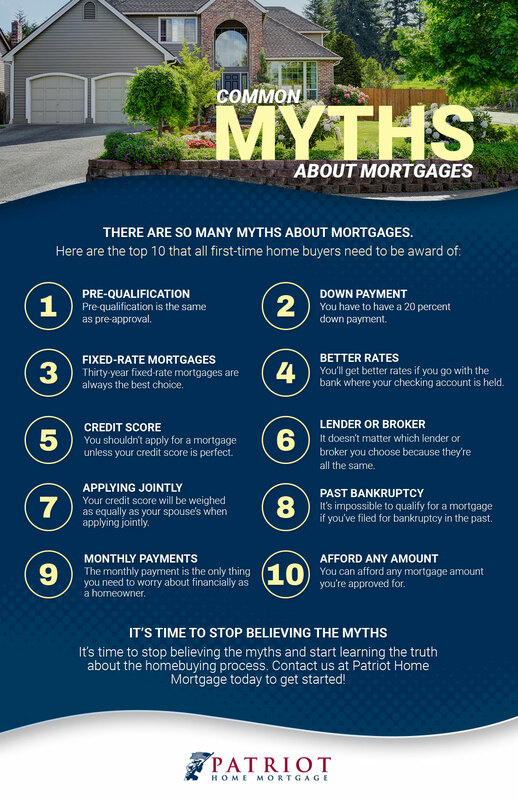 That’s why the experts at Patriot Home Mortgage have set out to debunk some of the most common myths about mortgages in this blog series. Myth #1. When you’re pre-qualified for a mortgage, you’re also pre-approved. A lot of people equate pre-qualification with pre-approval, and we get it, if you are pre-qualified for a mortgage, it sounds a whole lot like you’re pre-approved, too. But the two actually mean quite different things. If you’ve been pre-qualified for a home loan, the chances are very high that you’ll also be pre-approved. However, the pre-qualification is only a precursory estimate of how qualified you are to be approved for a mortgage; it’s not a guarantee that you’ll be approved. It basically means that you’ve met the initial criteria to be approved based on limited information, like your income, debt and assets. 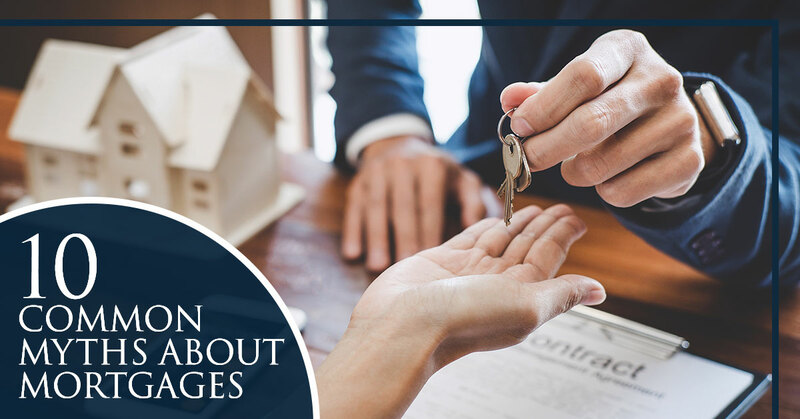 Getting pre-approved is a much more complex process that involves a formal loan application, as well as extensive documentation of your financial situation, including income, assets and debt. Myth #2. You have to have a 20-percent down payment. In this day and age, there are so many different types of mortgages from so many lenders that there’s a lot more leeway in the percent that you need to put down than there used to be. With an FHA loan, for example, you only need to put 3.5 percent down, and there are even many different types of loans that require no down payment at all, including VA Loans and USDA Loans. Although there are many loans that don’t require 20 percent down, there are benefits to putting 20 percent down if you can afford it. One of the biggest benefits of putting 20 percent down is that you won’t have to pay for private mortgage insurance (PMI), which is designed to protect the lender in the event that you default on your mortgage. However, it’s important to note that with most loan types, PMI goes away after the equity in your home reaches that 20-percent mark (except with FHA loans), and if you put off buying a home until you’ve saved up enough to put 20 percent down, rising home prices may mean paying more in the end even without PMI. Myth #3. A 30-year fixed mortgage is always the best option. Adjustable rate mortgages and fixed rate mortgages are the two basic types of mortgages you can apply for. With a fixed rate mortgage, you lock in your interest rate when the mortgage starts, and that rate never changes, even when interests rates go up or down. With an adjustable rate mortgage, after the initial, fixed-rate period, your interest rate changes based on market rates. When rates go up or down, your interest rate does, too. This myth is largely a result of the 2008 housing crisis, when many people with adjustable rate mortgages could no longer afford their monthly house payments after interest rates shot up. However, whether an adjustable rate or fixed rate mortgage is right for you depends on your circumstances. Sure, if you plan on living in the home for the next 30 years, then yes, a 30-year fixed mortgage may be the best choice. However, if you plan on only staying in the home for five to 10 years, you may end up saving more with an adjustable rate mortgage. Myth #4. It’s best to get a home loan through the bank that holds your checking account. Many people make the mistake of thinking that they’ll get the best rates if they choose to go with the bank they use for everyday banking — where they have their checking and savings account. And while some banks offer their customers better rates, most offer their customers the same rates as they offer everyone else. When trying to determine which lender to go with for your mortgage, it’s important to shop around. Get quotes from your bank as well as from several other lenders to get a good idea about the rates and terms they are offering. From there, you’ll be in a much better position to find the best option for your needs. Myth #5. You have to have a perfect credit score to qualify for a mortgage. Your credit history and credit score are two very important things that lenders look at when determining whether or not you qualify for a mortgage. Not only does your credit score impact whether or not you qualify, but it also impacts the rates you qualify for once your loan is approved and how much you are required to put down. However, that doesn’t mean that you have to have a perfect, 800+ credit score in order to get a home loan. If your credit score isn’t an 800, don’t fret. Most home loan types require minimum credit scores of between 620 and 640; however, for an FHA loan at 3.5 percent down, you only need a 580 credit score, and for an FHA loan at 10 percent down, you only need a 500 credit score. In our next blog, we’ll be debunking five more myths about mortgages, so stay tuned! Please contact us if you have questions or concerns, or you need assistance finding the right home loan for your needs.